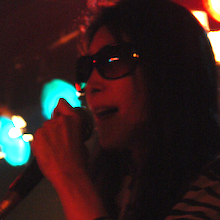 Who Junko is one of the founding members of the defining Japanese Noise band Hijokaidan (who helped to establish Noise music in Japan through a series of near-legendary performances involving no small amount of disgust and bodily fluids). She is the owner of the most intense voice in music. What Her solo vocal performances are incredibly musical and harrowing confrontations with the very real, physical and aural trauma of a woman screaming. Why To really get to grips with what is so affecting in being confronted with Junko’s solo performances then it helps us at least to deal with them on an emotional level, but also to try and understand how this experience forces you to think – a kind of conceptual experience – and what it might allude to. When we have seen Junko perform, there just seems to be something deeply symbolic about it: is a scream a break in language and in what can be said? Is it the otherness of language, or maybe a contradiction: both alive and dead, existing and not, moving between the real and the non-real? Is a female scream the perfect embodiment of Julia Kristeva's idea of abjection in art? "Beauty will be convulsive or will not be at all."